​pgAdmin is the GUI management tool for PostgreSQL. 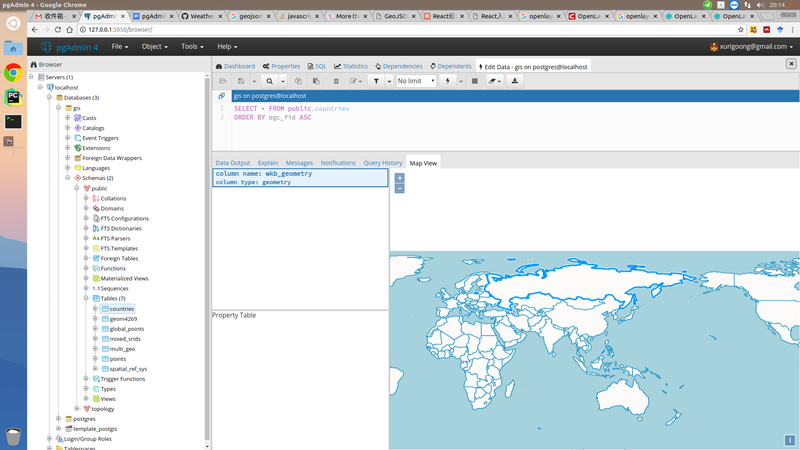 The latest version pgAdmin4 is web-based and written in Python and jQuery with Bootstrap, using the Flask framework. But currently there is no geospatial data viewer in pgAdmin4, and external applications, such as QGIS are required if we want to browser the data in a map. It’s not convenient for users to view geometries directly in pgAdmin4 “Data Output” table panel. 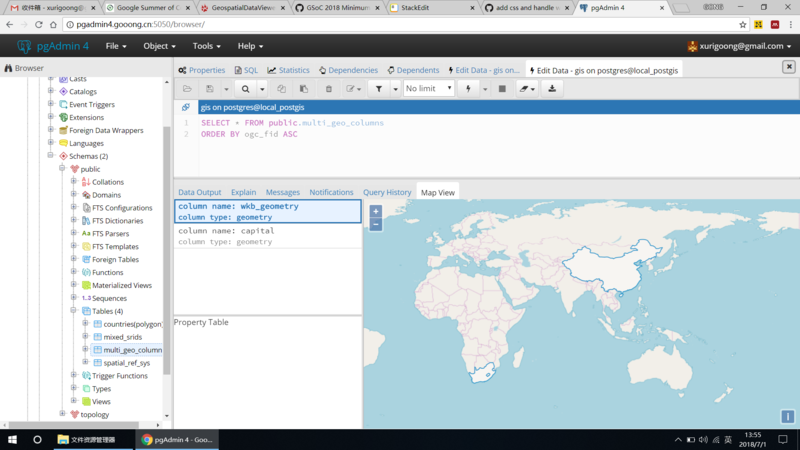 I propose to implement a geospatial data viewer in pgAdmin4 that will allow users to view the tables in a spatial database and the results of queries executed. With the viewer I intend to develop, users can directly view geospatial data on a map within the pgAdmin4 GUI. Set up dev environment and my wiki page for TODO list and weekly report. Introduce myself and this project in ​pgAdmin4, ​PostGIS and ​SoC mailing list. Get deeper into pgAdmin4 source code and learn more about require.js lib. 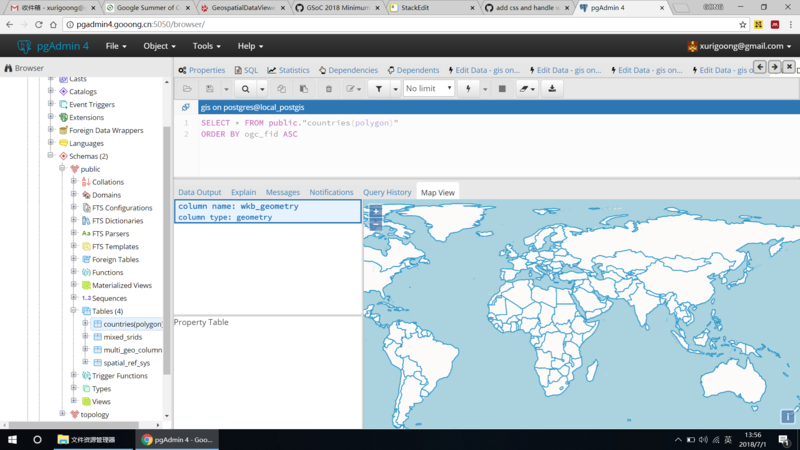 Create web UI for viewing map[part one]: Add the "map view" panel in pgadmin4 sqleditor. Create web UI for viewing map[part two]: Add layout and openlayers map in the "map view" panel. Implement parse_geo_data function to parse the query result data. 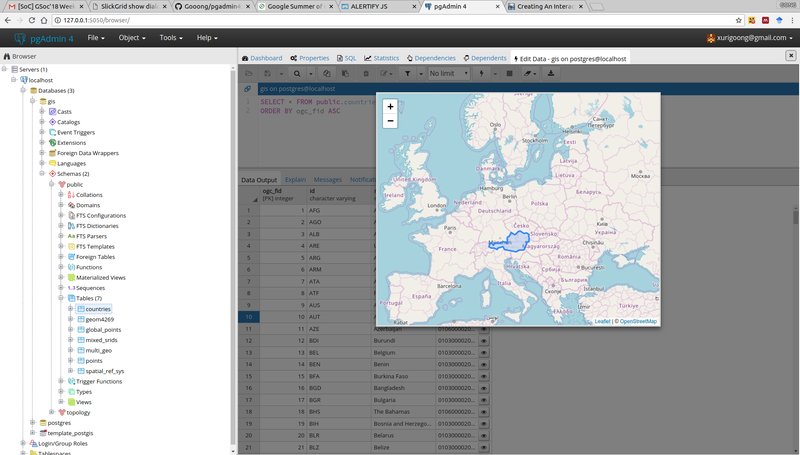 Add openlayers map and render the parsed result data in the map. Add function to group geometries with the same srid and render the group with max geometry number. Related discussion can be found ​here. This is the ​code commit link in my repository. I have also updated the design document for this function. Add column option for the viewer. 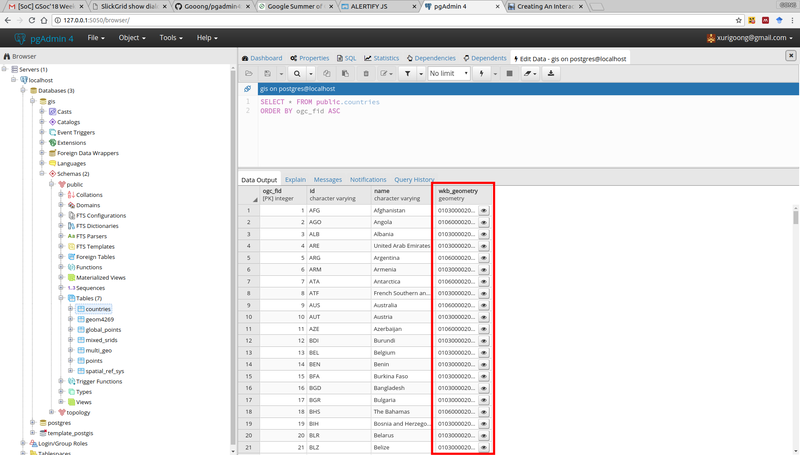 For query result with more than one geometry type column, the viewer will offer column option for user to choose which column to show in the map. It will still throw many warnings when importing openlayers lib, I will ask for help in the pgadmin community. Continue implementing geometry selection functionality mentioned in ​the design document 4.3. Fix the bug caused by unknown SRID. Implement property table to show the property of selected geometry. Create and execute unit tests in the regression frame for all modules to help catch regressions in the code. Check the code style to meet the ​pgAdmin coding standards. Create test for both geometry_visualiser and geoviewer. Send the patch in pgAdmin-hacker mailing list for code review. Create the final report page and finish the final evaluation. geoviewer screenshot 1.png​ (470.0 KB) - added by xurigong 10 months ago. geoviewer screenshot 2.png​ (429.0 KB) - added by xurigong 10 months ago. geometry_visualiser_screenshot1.png​ (239.9 KB) - added by xurigong 9 months ago. geometry_visualiser_screenshot2.png​ (506.0 KB) - added by xurigong 9 months ago. Selection_013.png​ (134.5 KB) - added by xurigong 8 months ago. Selection_014.png​ (221.1 KB) - added by xurigong 8 months ago. Selection_015.png​ (439.0 KB) - added by xurigong 8 months ago. Selection_016.png​ (116.8 KB) - added by xurigong 8 months ago.